In recent days, defrauded creditors of the Caspian Credit Institution have held protests in Tehran, Kermanshah, and Rasht. Women participated in these protest movements that took place daily in various cities of Iran. The Caspian Credit Institution, which is affiliated with the IRGC, is recognized and authorized as a financial institution by the Central Bank of Iran. Thousands of Iranians deposited their savings into the Caspian Credit Institution, only to lose all of their investments when the institution filed for bankruptcy last year. On Wednesday, February 13, 2019, the defrauded creditors of the Caspian Credit Institution in Tehran held a protest rally in front of the Judiciary building. After days and months, their situation remains unclear. The protesters demanded the implementation of Article 236 and the punishment of offenders, but so far no response has been given from government officials. On the same day, defrauded clients of the ADAK Khodro automobile company in Tehran, gathered in front of the Public Prosecutor’s Office building in District 5 and launched a protest movement against the company’s failure to meet their demands. The defrauded creditors of the Caspian Credit Institution in Kermanshah also launched a protest rally on Tuesday, February 12, 2019. During the rally, the protesters chanted, “A nation has never seen theft with a license”. On the same day, a number of buyers of registered cars from the Kerman Motor Company held a protest rally at the Ministry of Industry, Mine and Trade against the company’s violation of its contracts with buyers. Kerman Khodro clients have purchased their cars in April and June on fixed price by depositing 50 million tomans. But in November and December, when they were supposed to receive their cars, the company demanded another 30 million tomans while it was mentioned in the contract that it was not supposed to demand any more money and the price was fixed. 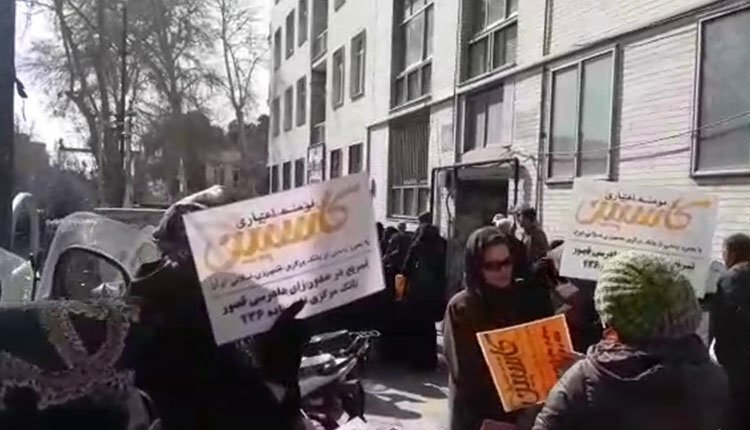 The defrauded clients of the IRGC-backed Caspian Institute also held a passionate rally outside the company’s branch in Rasht on Sunday, February 10, 2019. All the participants in this protest movement were women.